Another reading game, I am definitely on a roll! I find it harder to come up with ideas for reading games than number and writing activities, but I was given this lovely snow globe by one of my students and this idea just hit me. You are meant to put photos in the middle section, but for a bit of fun I have been writing decodable words for the children to read. There are 4 words for the students to read, 2 on each side. I have been changing the words every day, but other than that it’s been a fairly low maintenance activity as there is no photocopying. I just need to remember to check there is enough plain paper for them to use. 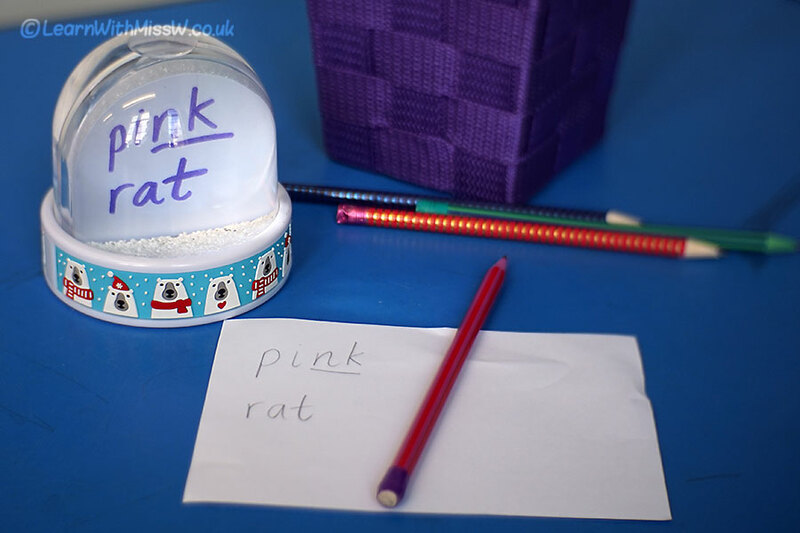 As well as decoding practice, this would be a good activity for practising tricky words or you could have pictures displayed and children would need to write the word. What shall I use the snow globe for next? Please write an idea in the comments section, thanks!